Here is the newest way of making a preparation. At the beginning most of the people had reacted in an extraordinary way. Extraordinary, even within the frame of autopathy, where everything tends to be extraordinary at least to some degree. A some time ago a young lady came to me, who has attended the courses on autopathy, and who had treated herself with autopathy, having had gradually moved from potencies made from saliva to those from breath with boiling. She had got as far as 15 liters of flow. She had no major problem; she was trying to improve on her emotional state of balance. Emphatically she asked me for my advise concerning making AP directly out of prana, without the means of any bodily substance. An answer came to me immediately: Make the preparation by pouring a little water into the round vortex chamber of a new autopathy bottle, only so much as not to allow any leak out through the outflow tube. Stand the bottle on the top of the head, in the area where the seventh Chakra is situated. Leave it there for about a minute. After this, go ahead with making up the potency. Report to me in three weeks’ time. Soon after this, I talked about this to my colleague, a thirty-five year old psychologist, who has been using autopathy, also on herself, for about two years. She said that she will try this method out. She found out that the seventh chakra in an adult person is situated about 15-20 cm above the head,. And not 2 cm, as I had told the other lady (meanwhile I found that out too, through my study of the old Egyptian frescoes). She used a high potency. After a month she sent me a report in which she said that for the first two weeks she was emotionally unsettled, that she even cried a little, but then she entered the state she described in her email as “an Absolute delight”. “I do not know if being aware of life’s perfection is the result of the pranic preparation, I had partially experienced this before, but now there almost is an urgency in this.” A month later in a conversation she was more specific in describing her state of mind: She is psychologically and emotionally balanced. She feels strongly that all that is happening is exactly as it should be. For the first time she feels no need to make any improvements on herself. She has no problems. After this, the first lady had made her report, stating that not much had changed. I advised her to lift the bottle during the preparation by about 15 cm up above her head. She overdid this, but with the potency of more than 50 liters of water, as I just found out, she nevertheless felt for 14 days “a strange lightness” with a sense of wellbeing. When repeating, it was lowered to 12 l, to make the effect last longer. During the course for advanced I announced what I had learnt from the second lady about the preparation from prana. 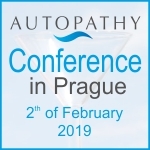 14 days later one of the participants sent me this email: “I would also like to let you know that I had tried the autopathy from prana with the results much the same to those you spoke about at our last meeting in Prague. One tends to feel that all is rather unimportant, finding oneself in such incredible contentment with a sense of well-being.” No less than that! And only 14 days after application, or in this case, instantly! The same day I received this happy news, I told it to my colleague Jan Matyas who works with me in our consultancy service. He reacted: “As soon as you told me about it I tried it too. About a week ago. Used 12 liters. With the same result. I was a bit tired and running behind the schedule, and now all is in order. I feel completely balanced.” All is in order! Incredible sense of well-being! Lightness! Balance, peace” This is what people report soon after application. All of them however had a few years of using autopathy behind them, and with the high potencies of 25 liters at that. One of the latest reports came from a lady, who first came for consultation only 5 days before a scheduled surgery concerning a very seriously diseased inner organ. She was to have AUTO 5 l prana every 2nd day, which she selected out of several possibilities. She managed to do it twice and then she wrote to me: Application from prana as agreed upon before tomorrow’s hospitalisation and operation – I notice an overall sense of calmness with sleeping improved.” She also used (as in the previous case) mask over her nose and mouth – see further on. Anyone who wants to experiment can try it out without any risk. I think that it might work even with the lower potencies. Boyed by this success, I too made a preparation from five liters of water, and improved upon it by using a folded handkerchief over my nose and mouth, even before I took the new bottle out of its packaging. This was to prevent transfer of any bodily information to the bottle through breath. The aim was to have only the information from prana that comes through the seventh Chakra. It had a strong effect on me even the same day. With the increased potency to 7 l after 5 days, the effect was even stronger. Those people were telling me the truth. My perhaps overactive left side of brain had immediately formed a theory about how it works: Our source (the transmitter) is in the fine-matter sphere, with which we are connected by the seventh chakra. The body (receiver) is tuned to the vibrations of the seventh chakra, it collects them, resonates with them, and forms itself in accordance to this, acts, thinks, and gains the harmonious form through the agency of vital power, prana, chi. In time, through various negative influences the tuning of the body (and the brain) changes, and the contaminated body no longer receives the signals of the fine-mater sphere, as it did before. It looks very much like a radio out of tune – the music still sounds, but it is disturbed and weaker, with humming and cracking. Eventually the resonance of the out-of-tune body with the seventh chakra ceases altogether, the consciousness is withdrawn and moves to the fine-matter sphere, leaving the body, which means physical death. A disease develops, as the out-of-tune body and mind lose the connection between the physical and fine-matter sphere of the person. If we make a potency and through it we transfer the fine information from the seventh chakra to the bodily sphere, via the sixth, the highest bodily chakra, we form a bridge that can help us once again tune the body up to the frequencies of the seventh chakra – the connection has been restored. The music plays once again. When we take the prana information from saliva or breath, it has already been influenced by contaminated body. If we take it from the seventh chakra, there is lesser contamination or none at all. But it is necessary to bear on mind that preparation made of saliva and breath has been tried out on many people and in many different pathological conditions, while this new way of preparation from prana is, at the time of writing (December 2012), still in the state of experiment. All the rules of using AP stated in the Get Well With Autopathy publication still apply. For instance, the Hering laws, selection of the initial potency according to vitality, incidental increasing of the potency with the repeated application, until the optimal results have been reached. Also application on a one-time basis with people who have already been using autopathy, in potency that brought the best results. From six liters onwards it is possible to make a single application a wait and see. Another application (perhaps in a slightly higher potency) can be made if we feel lessening of effect. The instructions how to make an autopathic potency from prana in Autopathy Bottle you find here.